Source: Based in New Delhi for Getty Images, photographer Daniel Berehulak writes for LightBox about his photo essay documenting the working life of coal miners in the Jaintia Hills. 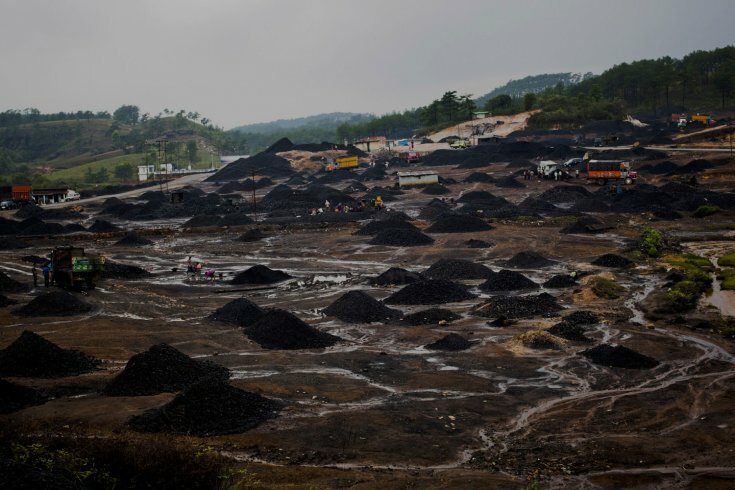 I traveled to India’s far northeast last month, before the monsoon rains set in and rendered the mines unworkable for the summer. 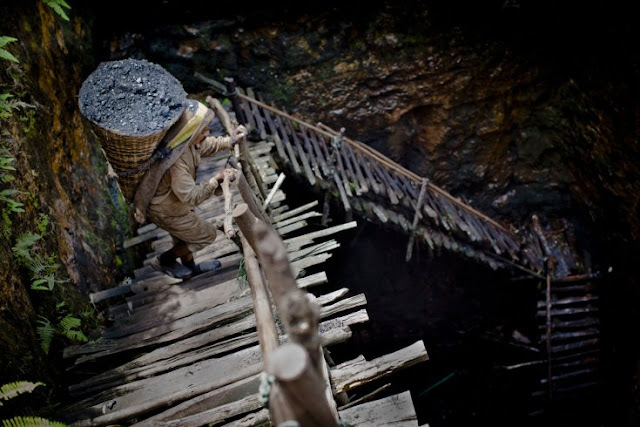 In the Jaintia Hills, in the remote state of Meghalaya, miners descend to great depths on slippery, rickety wooden ladders. 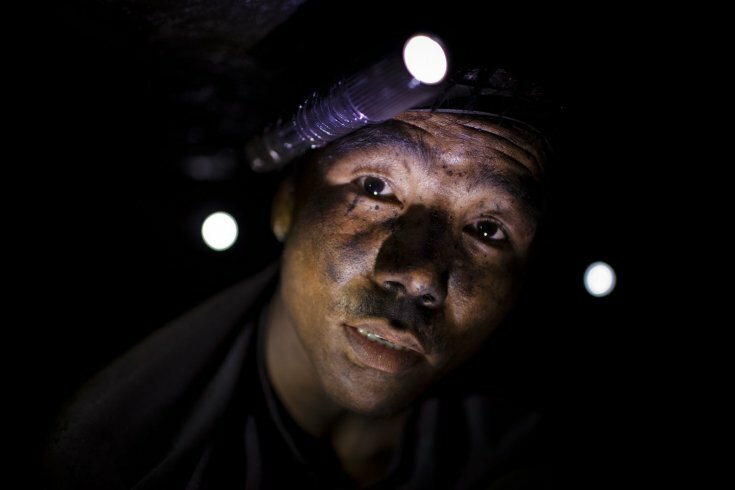 Men, women, even children squeeze into ‘rat hole’ tunnels lacing thousands of privately-owned and unregulated mines. 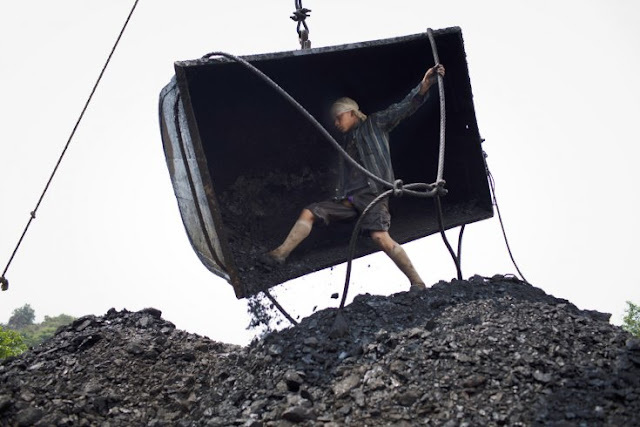 There, they toil to extract coal by hand with primitive tools and no safety equipment. I was unsure of what the story would hold or the conditions I would face. I spent a week there, though two days were lost to arguing with ‘guides’ who, we believe, were hired by the mine owners to keep us from reporting. We eventually got underground to witness what miners were enduring to scratch out such a sad and meager existence. As I was shooting an image of miners being lifted out from a shaft, about 300-feet deep, I wondered what I would do if the cable were to break and come crashing down. That is how four miners had died only weeks earlier. Where could I hide? Narrow shafts do not offer many escape routes beyond a few ‘rat hole tunnels’ that are two or three feet high. Prabhat Sinha, from Assam, carries a load of coal weighing 60kg's, supported by a head-strap, as he ascends the staircase of a coal mine near the village of Khliehriat, in the district of Jaintia Hills, India. miners descend to great depths on slippery, rickety wooden ladders. 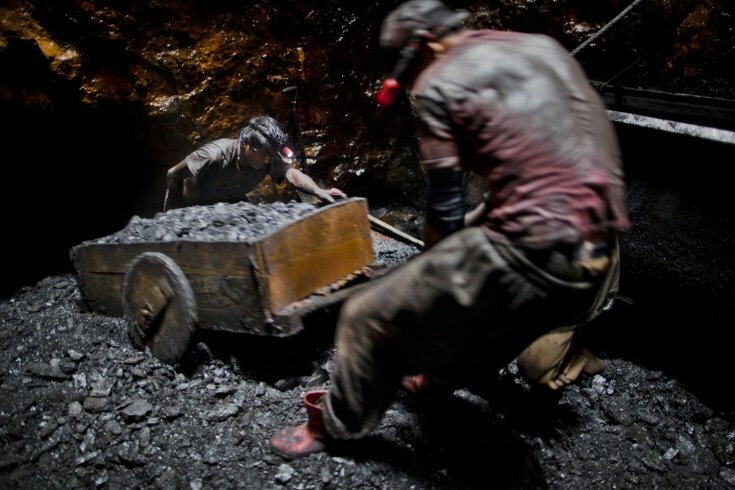 Children and adults squeeze into rat hole like tunnels in thousands of privately owned and unregulated mines, extracting coal with their hands or primitive tools and no safety equipment. 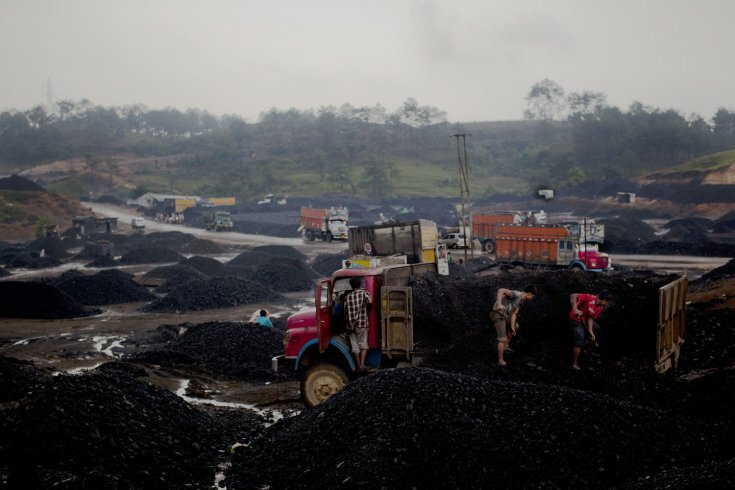 Workers load coal onto trucks at a mine in the Jaintia hills, located in India's far North East state of Meghalaya. Fourteen-year-old Chhai Lyngdoh, kicks out the coal from a container, as it is emptied onto a heap, after being craned out of a 300ft deep mine shaft. Workers load coal onto a truck at a coal depot. 20 year old Anil Basnet pushes a coal cart, as he and a fellow worker pull coal out from the rat hole tunnel 300 ft below the surface. 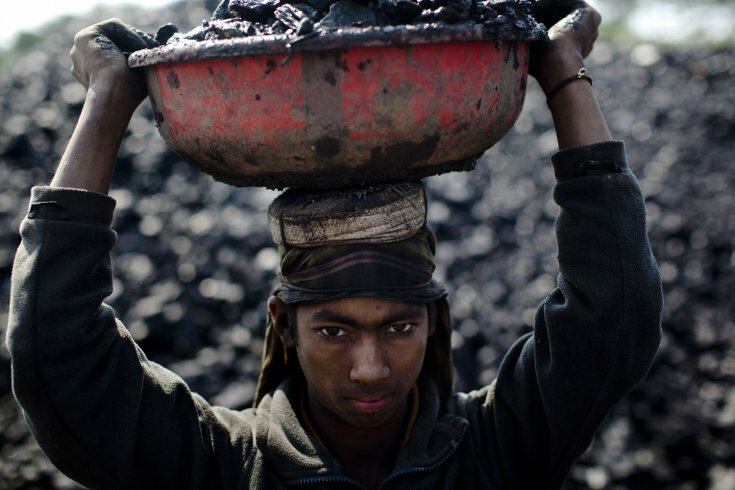 22 year old Shyam Rai from Nepal pauses as he works, digging out coal, using hands and a pick to get at the seams of coal. 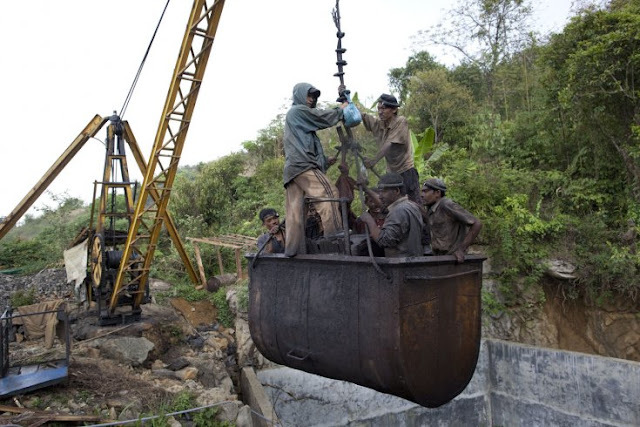 A crane lifts miners out of a 300ft deep mine shaft, as they head out for their lunch break. 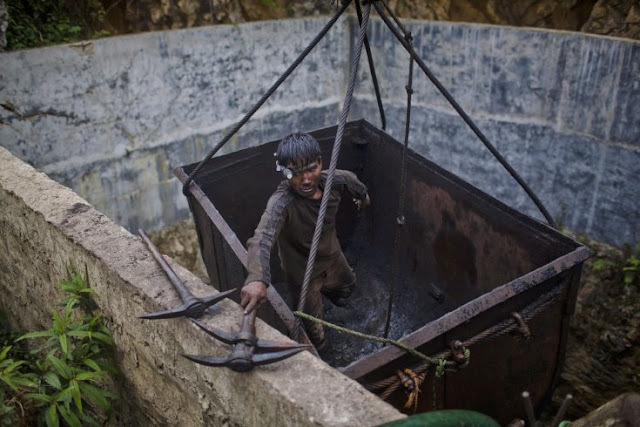 A miner unloads tools after being hoisted from the depths of a coal mine. Coal miners wash themselves off as they break for lunch at a coal mine. 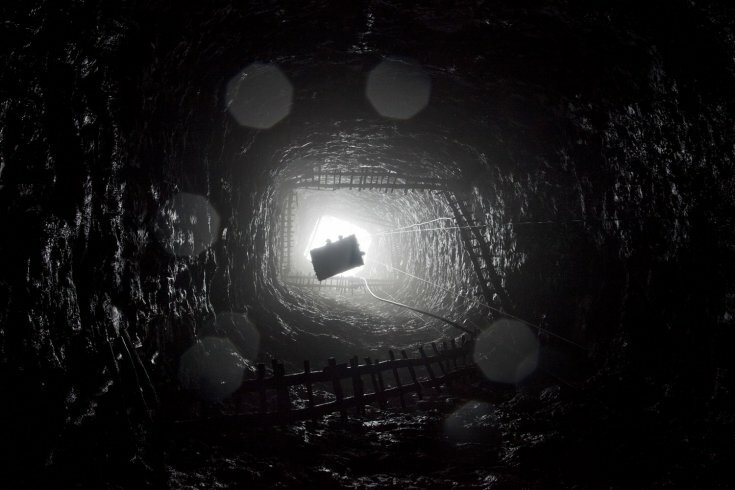 A crane lifts miners out of the 300ft deep shaft of a coal mine. 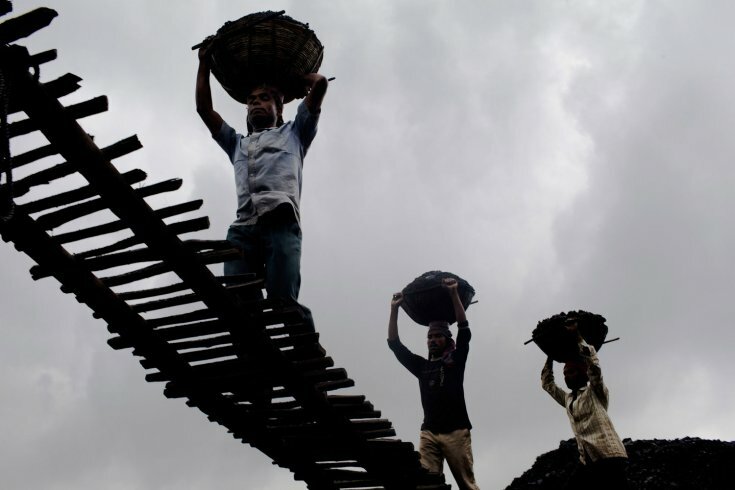 Workers load coal onto trucks at a coal depot. After traversing treacherous mountain roads, the coal is delivered to neighbouring Bangladesh and to Assam from where it is distributed all over India, to be used primarily for power generation and as a source of fuel in cement plants. 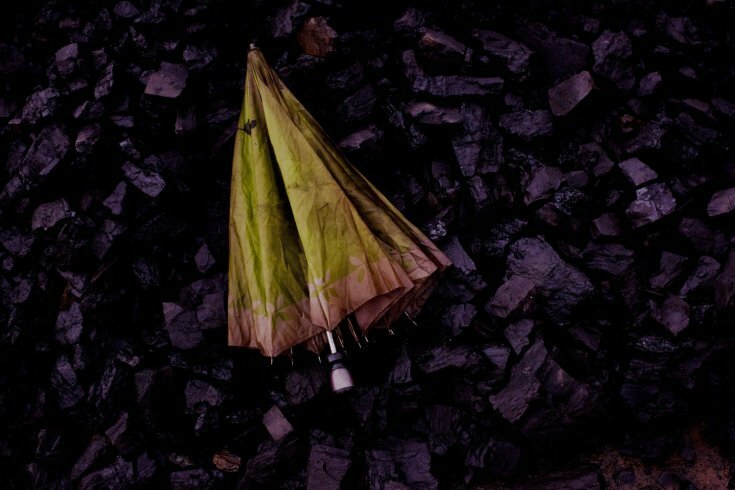 An umbrella lays discarded on a heap of coal.